High school graduation rates have soared across the country over the last decade, accompanied by the cheers of educators and lawmakers alike. But in the vast majority of states, simply attaining a high school diploma does not qualify students to attend a public university, according to a study released Monday by the Center for American Progress. The report examines coursework requirements in math, English, science, social studies, foreign languages, art, physical education, and electives for both graduation from a public high school and entrance to a public university in every state, Puerto Rico, and the District of Columbia. Each state issues different mandates for different subjects, and a handful want to see a demonstration of mastery rather than completion of specific courses. 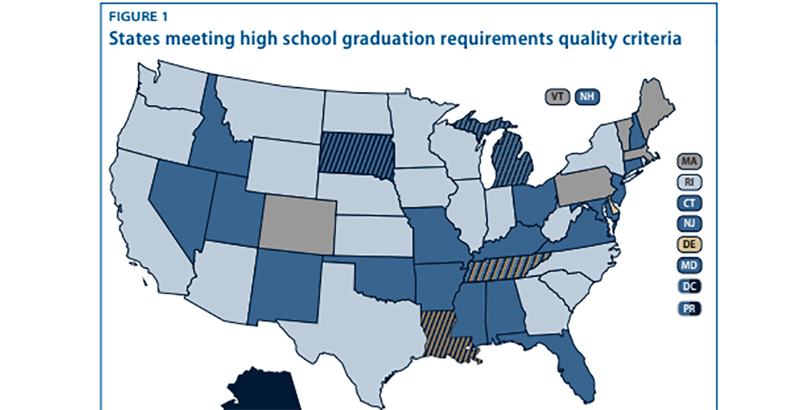 In just four states — Louisiana, Michigan, South Dakota, and Tennessee — do the requirements to achieve a basic diploma (i.e., non-honors) also qualify a student for enrollment at a public college. Alaska, Puerto Rico, and Washington, D.C., are also technically aligned, but only because their respective public college systems don’t make any coursework requirements. In 23 states, foreign language requirements for high schools do not correspond with those for public universities (typically two years of study). In eight states — including California, Texas, Maryland, and Indiana — math requirements between the two sectors do not match. 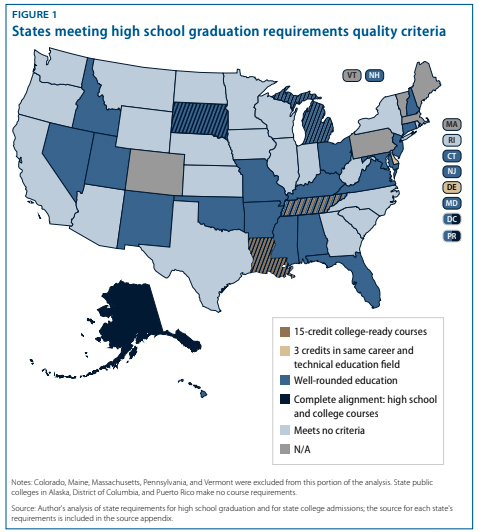 In a few states, students may attain sufficient credits in multiple subjects while still not qualifying for college-level work. Graduation requirements in Wisconsin are insufficient for entry at the University of Wisconsin in five separate subjects (math, science, social studies, foreign languages, and electives). In California, home to perhaps the best-regarded public university system in the world, entry requirements for math, English, foreign languages, and art at University of California and California State schools all exceed completion requirements at California public high schools. Coherence of academic requirements can sound like an abstract consideration, but for millions of students, it can mean the difference between graduating from college and dropping out after a semester or two. Large numbers of freshmen enter college unprepared each year, destined for remediation classes that teach material they should have learned as high schoolers. The on-time graduation rate for college students who begin in remediation is around 10 percent. To ensure that graduating seniors are ready for either post-secondary education or a decent job, the report recommends that states implement a more comprehensive set of completion requirements, including a sequence of 15 courses (four years of English, three years of math up to Algebra II, three years of lab science, three years of social studies, and two years of foreign language study) necessary for enrollment at most colleges and at least three credits in some career and technical education field. At present, no state employs all of the report’s recommended policies, though both Delaware and Louisiana are close. A spate of scandals involving artificially inflated high school graduation statistics has shaken the confidence of education advocates over the last few years. At Washington, D.C.’s Ballou High School, where every senior earned a diploma in 2017, half of the graduating class missed at least three months of class unexcused. Many now fear that the nationwide emphasis on lifting high school completion rates has led to lower standards that will leave graduates unprepared for what awaits them in either college or the workforce.